^ 伊留申-476运输机首飞中国或成首个海外客户. 环球网. 2012-09-25 [2012-12-27]. ^ 伊留申-476首架样机完工传中国将购40架. 环球网. 2012-12-26 [2012-12-27]. ^ Canadian Parliament Website 互联网档案馆的存檔，存档日期2007-10-13. ^ 俄向中國空軍提供十架二手伊留申-76MD. AirForceWorld.com. [2013-06-17]. （原始内容存档于2013-06-24）. ^ First serial-production Ilyushin Il-76MD-90A strategic airlifter made its maiden flight. January 5, 2015. ^ "Air Congo Ilyushin Il-76", Airliners.net. ^ "Ecuatorial Cargo Ilyushin Il-76TD", Airliners.net. ^ "Atlant-Hungary Ilyushin Il-76TD", Airliners.net. ^ "HUK - Hungarian Ukrainian Air Cargo Ilyushin Il-76TD", Airliners.net. ^ "Chabahar Air Ilyushin Il-76TD", Airliners.net. 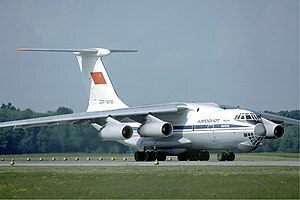 ^ "GST Aero Ilyushin Il-76T", Airliners.net. ^ "Jamahiria Air Transport Ilyushin Il-76/78", Airliners.net. ^ Jet Line. [2007-12-26]. （原始内容存档于2007-12-15）. ^ "Ilyushin 76 互联网档案馆的存檔，存档日期2007-09-28. ", Aerolift 互联网档案馆的存檔，存档日期2007-03-12. ^ Hassan, Mohamed Olad. "Cargo Plane Is Shot Down in Somalia," Associated Press, March 23, 2007. ^ Algeria plane crash sees '105 killed' after coming down near airport. The Sun. 2018-04-11 [2018-04-11] （英国英语）.